Daryl Laws - Body Unlimited, Inc. Question: I am in the 11th grade and played baseball for my high school. Then I played on a 16U team and now could play fall ball but there are things I know I need to do to be a better player. I make consistent contact with the ball but don’t get much distance. 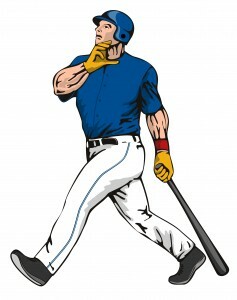 I know you train a lot of ballplayers so what are your thoughts about playing and training? Answer: School will begin soon so your free time will disappear and the option of doing both disappears. A choice must be weighed out between continuing to play or choosing to work to be a better athlete. Since you have played essentially two seasons already and have skill at making contact with the ball you need strength to make that contact count. That comes from training not continuing to play. Take some time to become a better athlete. Then when your high school season begins again you will make a greater impact. Work your core. That’s abdominals, quads, glutes, hamstrings and lower back which are essential to a powerful swing and throw. Training those muscles also contributes to better speed. There are specific exercises we use to coordinate the groups but there are some general ones that you can do. Cleans from the floor using a moderate weight working to improve speed of the movement as well as increasing strength. Lunges are an excellent exercise to work all the muscles of the legs, hips and glutes. The deadlift is also a great exercise but it doesn’t need to be exclusively for heavy weights but one for speed and strength. For abs do what we call 3D abs and cover upper, lower and sides with three different exercises in a sequence. and at the end of every workout stretch. Seriously stretch. Within a few weeks your power at the plate will improve dramatically. Get Updates! Enter your e-mail address to receive a short notice when I make a blog post, or have important news or information you wouldn't want to miss. You'll also receive a link to my Free eBook - Density and Volume Training!